I rarely advertise any products, and even though this is not physically available yet: get your USB Nitrokey Storage at Indiegogo until tomorrow. Realized with Open Hardware and Free Software it will enable secure logins, encryption, backups, ... Further information is available at the Nitrokey web site. Found one of my favorite cheese to have a 1337 quality assurance sticker. Did you know that the word "unsafe" contains NSA? Yesterday night we had the privilege to see a blooming titan arum (Amorphophallus titanum), the largest flower on Earth, in the botanical garden's greenhouse at Planten un Blomen, a nearby park in the center of Hamburg. Privilege because it took years to start blooming and already the same night it collapsed again. The titan arum is also known as the corpse flower or stinky plant, and it really deserves the name, it smells like rotting meat to attract beetles for its pollination. 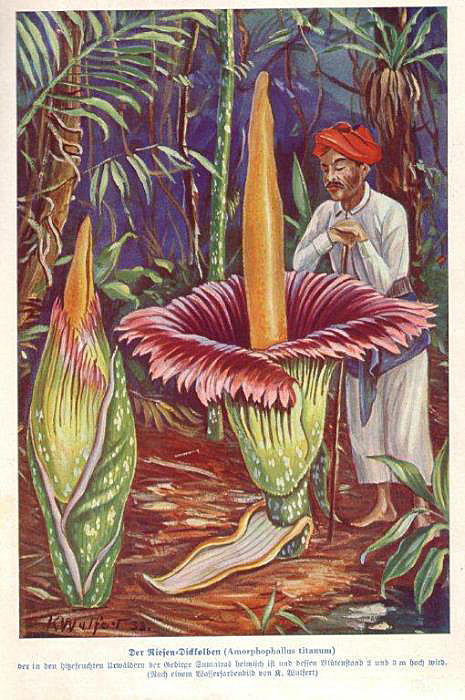 A historical illustration from Kosmos Handweiser für Naturfreunde 1934 depicts how large this flower could grow, the one we saw reached "only" 163cm. The website of the Botanic Garden Hamburg has some more pictures of the progress since July 2, additional information in German can be found there. Also the United States Botanic Garden at Washington D.C. expects a titan arum to bloom about every day now. There's a time lapse video of the Hamburg titanum blooming. The U.S. Botanic Garden one bloomed July 21st to 22nd and there's also a time lapse video. Very pretty. We act as if there's no tomorrow. A cartoon about the impossibility of infinite growth on a finite planet. Time to put my old blog into Zombie state and start something fresh. The ancient JRoller 3.1 instance I had my account on wasn't really appealing anymore.. so I peeked around and found Serendipity that looks promising, easy to install and lots of features.